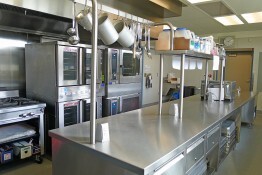 Kitchen renovations at Davis, Heritage and Lakewood Elementary Schools and Morada Middle School. Complete demolition down to the stud walls at all sites. The kitchens are transformed into state-of-the-art commercial-grade workspaces with stainless steel counters, all new equipment, fixtures and finishes, including plumbing, mechanical and electrical. 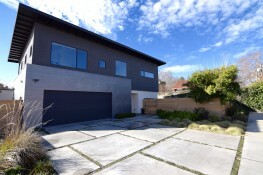 3,000 square-foot contemporary home design on a 40 x 160 lot in East Sacramento. 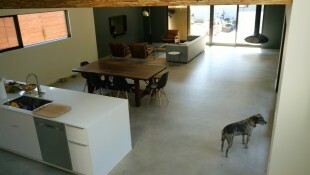 Two stories and four bedrooms with room to breathe and grow. 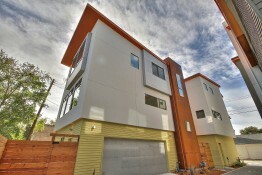 Four custom home designs on Solons Alley in Midtown Sacramento. Two 1,452 square-foot homes and two 1,899 square-foot homes with efficient floor plans, contemporary finishes, quality materials and optional solar panels. Two-story, 2,208 square-foot home in Sacramento’s Curtis Park neighborhood. Millennium-modern design uses Corten steel and includes beautiful windows and sliding glass doors for indoor/outdoor appeal. 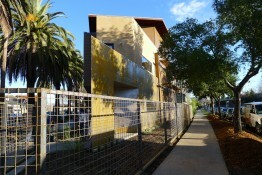 Triangle residence at 28th and V Streets in Midtown Sacramento is a 3,062 square-foot duplex with one-bedroom, one-bath on ground floor and three-bedrooms, two-baths on the second and third floors. Contemporary home design in Midtown Sacramento. This 1,819 square-foot home is on a 33 x 80 alley lot. 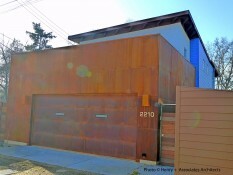 Exterior finishes, including Corten steel, create a sense of place in this urban setting.